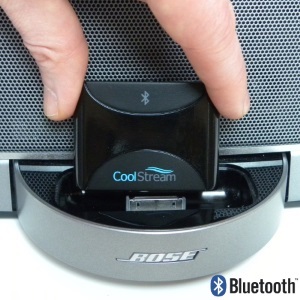 The CoolStream Duo is a small, lightweight Bluetooth Receiver designed to fit on the traditional Apple 30-pin iPod connector. 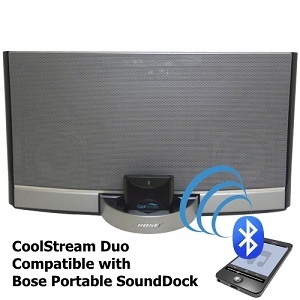 When you place the Duo on your docking station, such as the Bose SoundDock, you can pair it to your phone or tablet and then stream whatever music you have stored on your phone or whatever 3rd party application you prefer such as Spotify or Pandora. 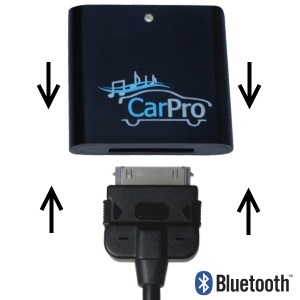 It is mostly used with docking stations, but it also works with some cars and motorcycles that also have the traditional Apple 30-pin iPod connector. Will the Duo work with my Docking Station, Car or Motorcycle? We have tested the Duo on many docking stations, cars and motorcycles. 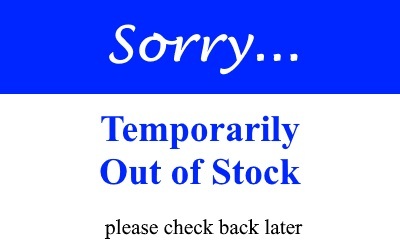 Please check out our list to see if we are a good fit for you. What if I don’t see my Car or Motorcycle on the list? 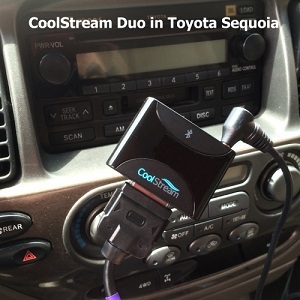 If you have a factory installed 30-pin cable and your car is not listed as working with the Duo we recommend checking out the CoolStream CarPro. Why is it called the Duo? 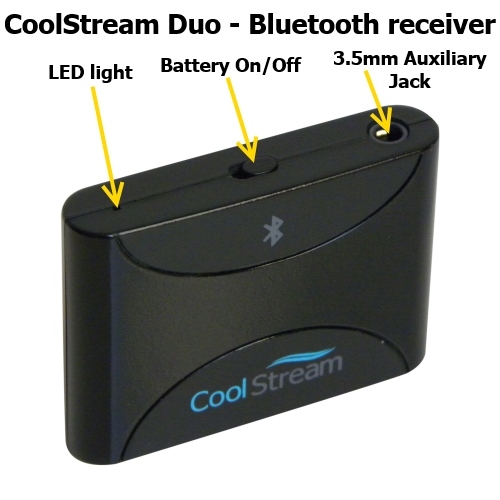 The CoolStream Duo is equipped with an internal rechargeable battery. This allows you to use the Duo in two distinctly different ways. When you place the Duo onto a docking station or on a 30-pin charging cable the battery is being charged. 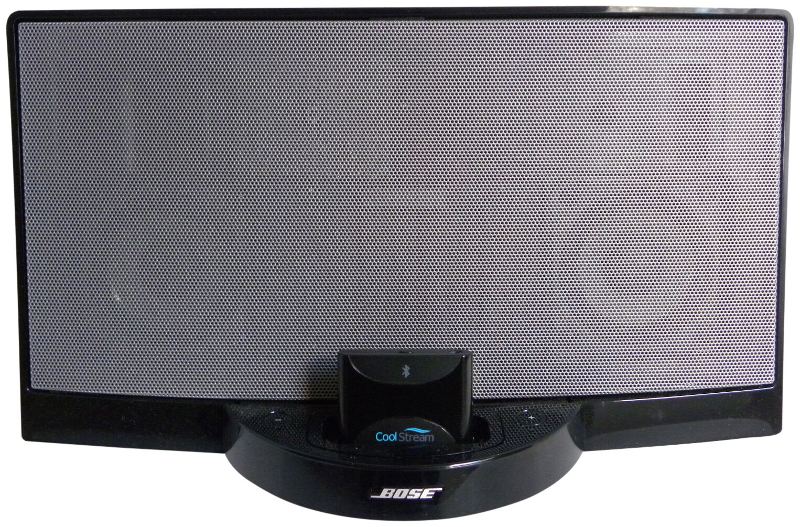 Once it is fully charged, you can remove the Duo and enjoy up to 4-5 hours of streaming by activating the battery. What does having an internal battery mean? The battery feature on the Duo allows you to use the Duo in different ways. 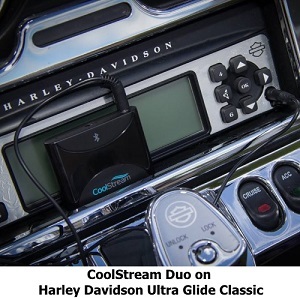 The 3.5 mm port on the top of the Duo serves as a second way of connecting the Duo to cars, headphones, motorcycles, boats, boom boxes or anything that has an Aux port. The switch on the top of the Duo is used to activate this battery feature. When it is placed to the left you will have 4-5 hours of streaming capability or you can switch it to the right to conserve the battery for later use. When the Duo is in use the recommended temperature of the surrounding environment should be between 32℉ – 95℉ (0℃ – 35℃). 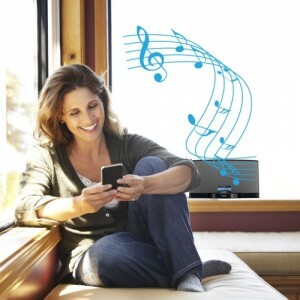 With the CoolStream Duo you can connect 2 mobile devices like your iPhone and your iPad or your Android phone and your room-mate’s Mac. 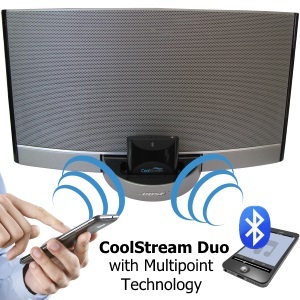 By having 2 devices connected to the CoolStream Duo you can switch back and forth between styles and genres or have a good game of Dueling DJ’s. How do I use the Multipoint feature? 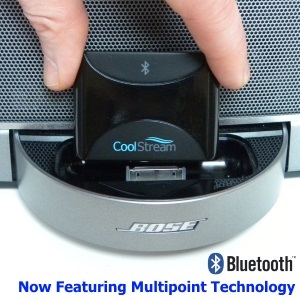 Power on CoolStream Duo by either plugging it into a docking station or by turning on the built-in battery by switching the top button over to the left. 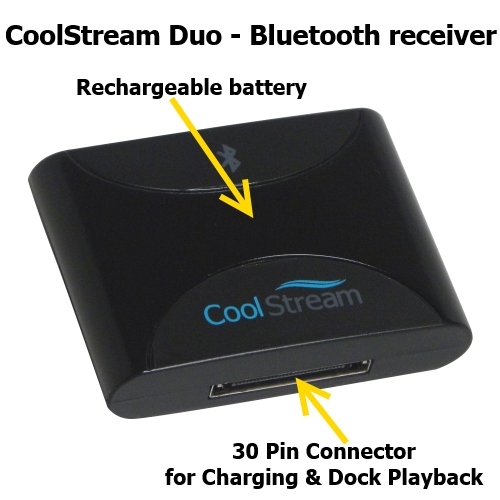 Pair first mobile device to CoolStream Duo. Turn off the Bluetooth function of the first mobile device under Settings. 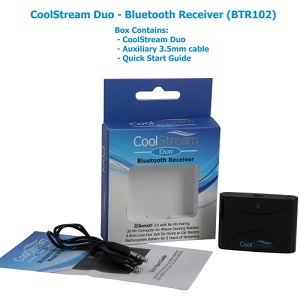 Pair second mobile device to CoolStream Duo. Turn on Bluetooth function of first mobile device. 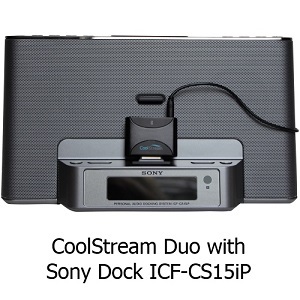 CoolStream Duo should appear and automatically connect.